Last week I talked a lot about "here we are"—bracing for and embracing change. Judging by your comments and several other Poetry Friday posts, I am not the only one who has been grappling with uncertainty, looking for answers, or turning to poetry to soothe and settle mind and heart. Available for purchase at Amazon and QEP. A "hot off the press" Children's Book Council selection for 2017, this may not be the first time you've heard about HERE WE GO, released by Pomelo Books earlier this month. It wouldn't be difficult to write my whole post by borrowing bits and pieces from others: I thought Mary Lee Hahn was spot on when she called it "the right book at the right time," Irene Latham was her usual perceptive self when she said it "invites questions and doesn't demand answers," and Margaret Simon did a great job writing about the "grit" and determination it takes to put yourself out there—something required of every activist. But since this is my internet podium, allow me tell you what this book means to me (aside from the fact that I'm pleased as all get out to be a part of it!) . . . HERE WE GO is a harbinger of hope. Sylvia Vardell and Janet Wong impress the heck out of me. and teaching community, and ready to urge us one step further. 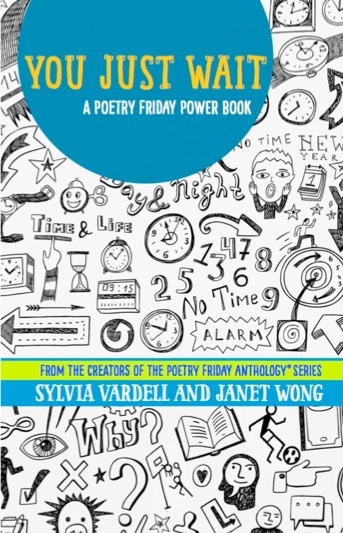 Why is this a "Poetry Friday Power Book"? Because we believe in the power of poetry to express our deepest feelings, and our most powerful experiences, and to inspire us to use our words to create change in the world. 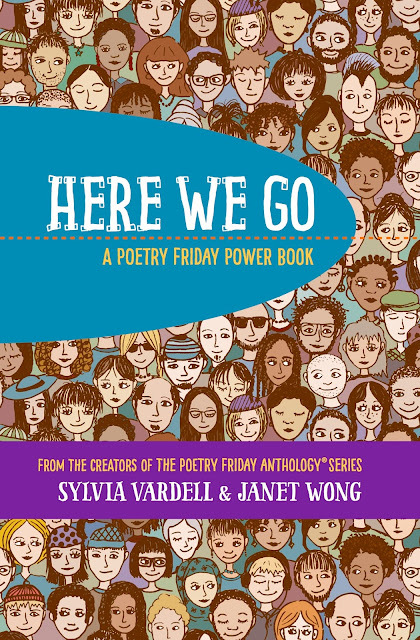 Like its predecessor, YOU JUST WAIT (reviewed here last September), HERE WE GO is a mash-up between an anthology, a verse novella, and a poetry workbook. It also comes with an abundance of useful back matter. But what I love most is the interactive "PowerPack" format that guides readers through the process of reading, thinking, writing, and responding. It's a winning formula for writers of any age and ability to spur creativity, make connections, and get their own words and ideas flowing. Perfect for home or classroom, I like to think of HERE WE GO as the little engine that could. Without being preachy, it helps young readers recognize that they have a voice and gives them the confidence to make a difference, to make to the world a better place. The story centers on four young friends—Ameera, David, Jack, and Jenna. 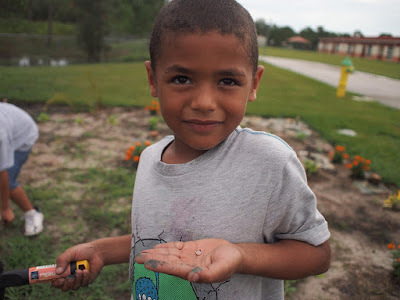 They come from diverse backgrounds and each face unique challenges at home, but together they discover that kindness, gardening, and activism go hand-in-hand as they strive to make an impact in their community. Young readers will see that no matter their family situation or the socio-political climate, they are not alone. We all have struggles, yet it's our differences that make us stronger when we work together. I love with what Janet and Sylvia did with PowerPack 8. It opens with a PowerPlay activity that asks the reader to circle every third word in a passage and then, using some of those words, come up with a three-line poem—a tercet. 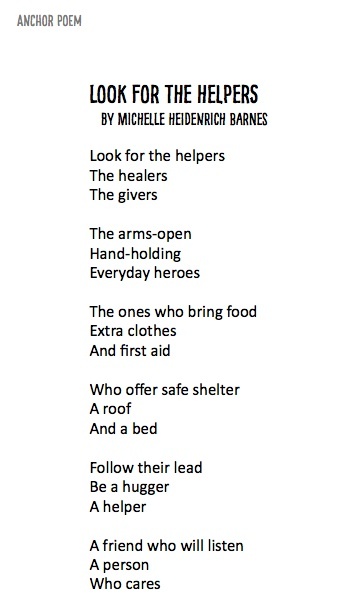 Next is my poem, "Look for the Helpers," which originally appeared in THE POETRY FRIDAY ANTHOLOGY FOR CELEBRATIONS. Don't you love that ending? "There's only room for kindness here"—YES! followed by a Power2You writing prompt. 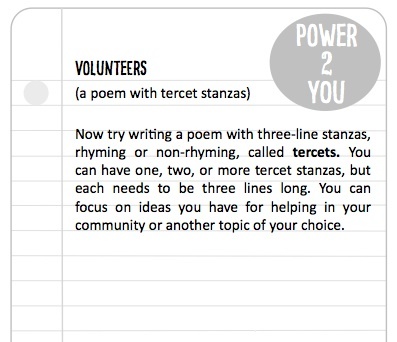 Now it's your turn to write a poem using rhyming or non-rhyming tercets. If you accept this Power2You challenge . . .
Write a short poem about HOPE or HELPING using tercets (one or two stanzas is plenty) and I will share it here. Leave your poem in the comments below or email it to TodaysLittleDitty (at) gmail (dot) com. 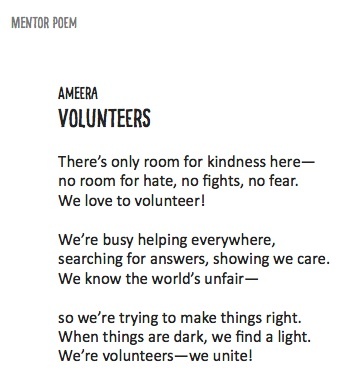 Since you've already read my poem about helping, I'll start us off with a tercet about hope. our garden swells with pride and leaves. Hope pushes through the solitude. 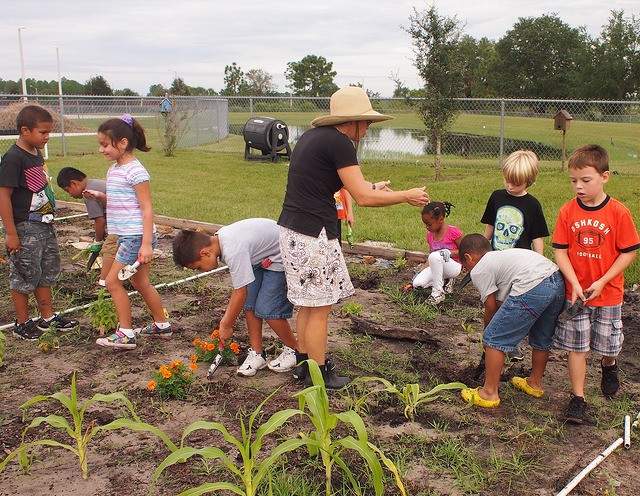 to teach is to hope. for a global hatred decontamination. 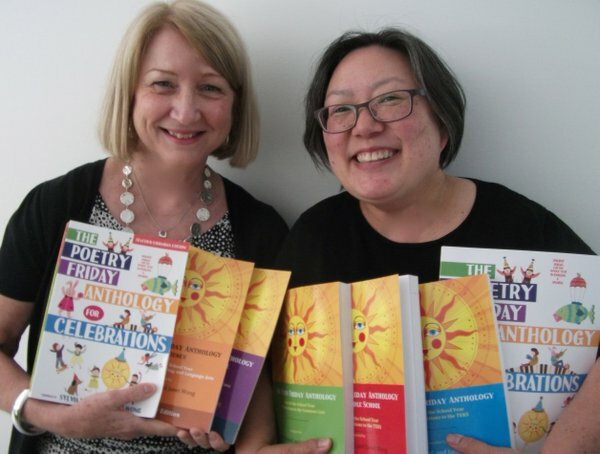 Janet and Sylvia are two of the most generous people I know, and not surprisingly, they have provided me with several copies of HERE WE GO to give away to readers of this blog post. 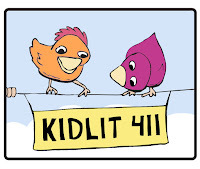 This is the perfect book to share with a a young person in your life—a child, grandchild, niece or nephew, your students, a scouting troop, an after-school group...? Or maybe you'd like a copy just for yourself. That's okay too! As we did last time, you may request 1, 2, or 3 copies, but you must leave a comment on this post no later than Tuesday, January 31st, in order to be entered. You do NOT have to write a tercet poem in order to be entered—that's just for fun—though I am curious about how you plan to use the books. (For those who have trouble leaving comments, email me at TodaysLittleDitty (at) gmail (dot) com and I will post your comment for you.) Winners will be chosen randomly until all the copies are gone, and announced next Friday, February 3rd. Sometimes it's hard to see beyond the daily news and our own busy lives, but just to put things in perspective, today (January 27) is Holocaust Remembrance Day. My mother-in-law was an Auschwitz survivor and a remarkable woman in so many ways. 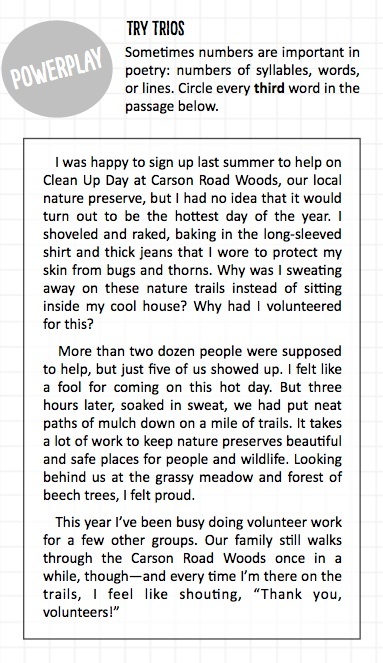 I'd love to share some of her inspiring personal stories with you, but that's a post for another day. In the meantime, let's be grateful for having learned from mistakes of the past and unite in our determination not to let them happen again. Plant seeds of love, not hate. 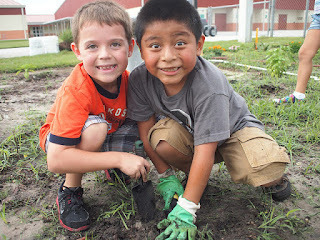 Carol Varsalona is all about planting seeds of love and gratitude. 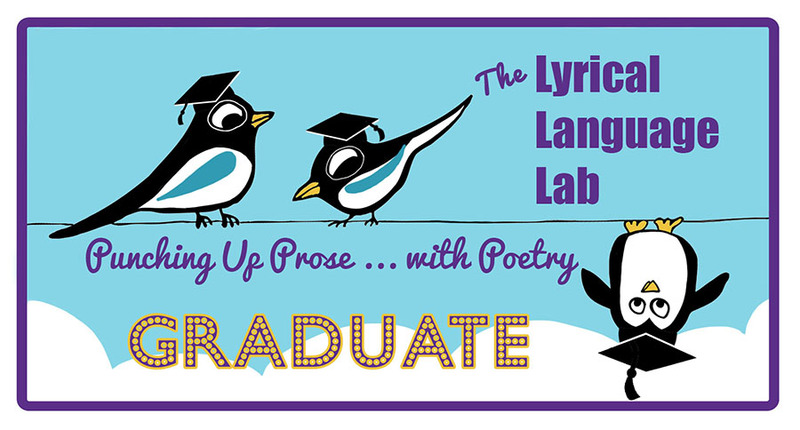 Join her for today's Poetry Friday roundup at Beyond LiteracyLink. Nobody holds your hand up there. It's not as smooth as an elevator. It's scarier than an escalator. Of the chair lift clanking along its track. 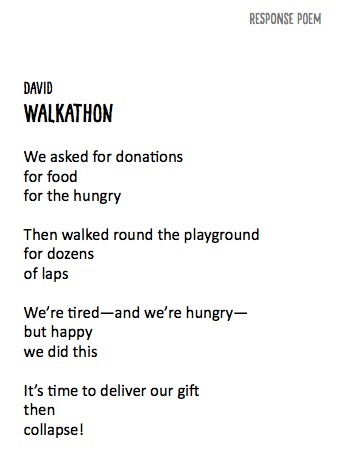 From OPENING DAYS: SPORTS POEMS, selected by Lee Bennett Hopkins (Harcourt Brace & Company, 1996). The metaphoric chair lift has been clickety-clackety-clanking for many months now. My anxiety has been climbing as well. Now that we've reached the summit, I try to take in the grandeur and possibility of 2017, but I'm distracted by the daunting slope. 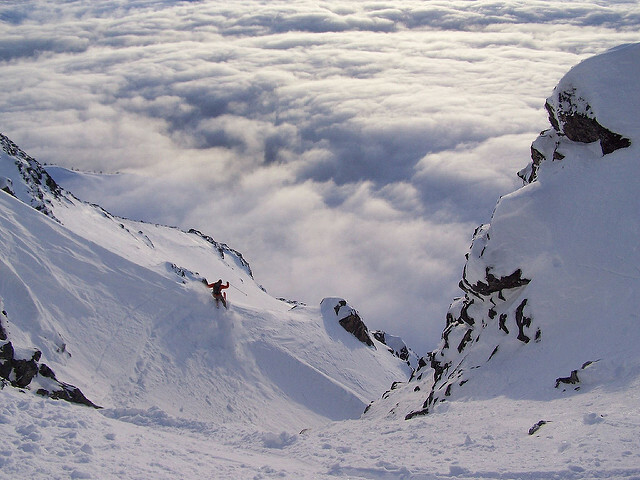 I've never been much of a skier. My introduction to downhill skiing was a weekend trip with a group of teenagers, mostly older than myself, all of whom already knew how to ski. The first morning was great—beautiful weather, I had a newbie lesson and mastered the bunny slope. But the afternoon brought sleet and an intermediate run that was well beyond what this bunny could handle. What I remember most was the trail of blue dye that followed me down the mountainside, sliding down on my bottom in brand new jeans. It would have been embarrassing had I not been paralyzed by fear. And yes, I probably could have taken my skis off and walked, but that would have been far too sensible. The second day I feigned illness and had the house all to myself. Far more sensible. So here we are. As much as I might like to stay home and ignore the challenges ahead, it's not an option. I'm not sure what's on the horizon—politically, creatively, personally. I've got two teens of my own navigating the landscape. Whatever the future holds, it feels big and new and definitely scarier than an escalator. My head is telling me to hold on. My heart is urging me to let go. 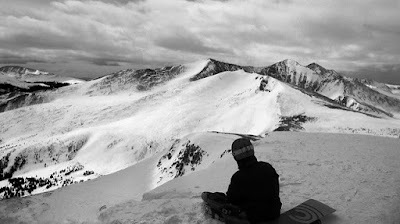 But first it means heading back to the bunny slope for a refresher course. It means building up my core and balance, and trusting that the chaos I'm feeling right now is exactly where I need to be. To open myself up for something beautiful and extraordinary, though I'm not sure what and when and how. At first I thought my "one little word" for 2017 would be self-love. But then I realized it's not. It's change. Self-love is the means to embrace that change. I've got a new pair of jeans packed and ready for the trip. If you see a trail of blue, make sure to wave. Here's some GREAT news to start off the new year... a new Poetry Friday Power Book by Sylvia Vardell and Janet Wong that's a Children's Book Council "Hot Off the Press” selection for January 2017! 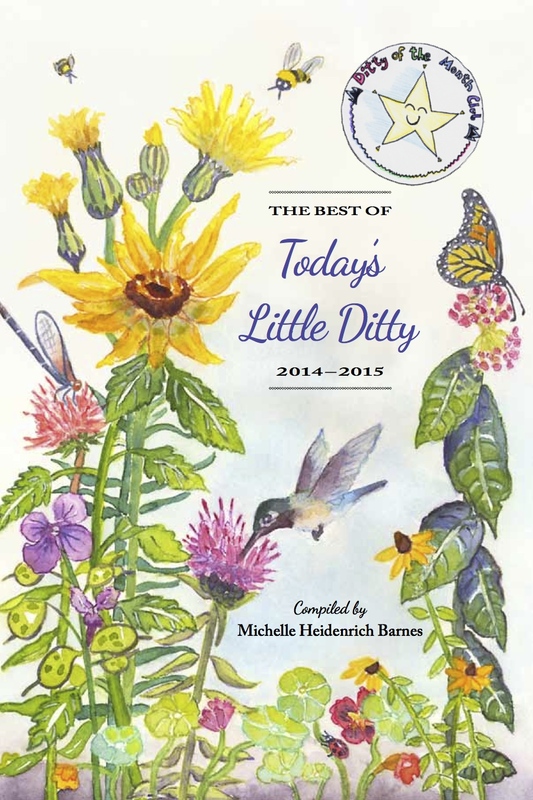 I'm honored have my poem "Look for the Helpers" included in HERE WE GO. 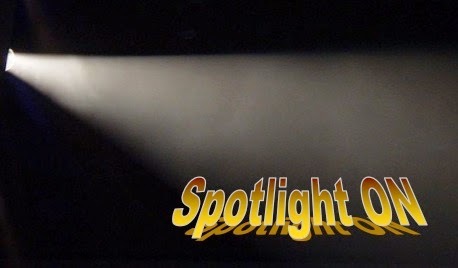 Next week I'll have an in-depth look and a power-packed giveaway. After that, we'll return to our regularly scheduled programming. 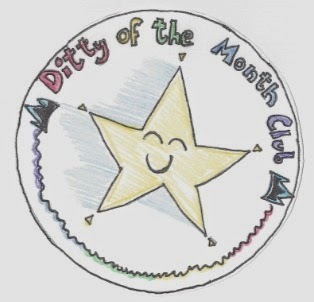 So sharpen your pencils, poets—the Ditty of the Month Club will be back on February 3rd! 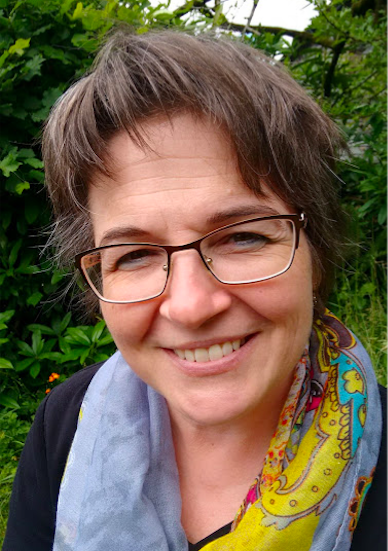 In the meantime, please visit Laura Purdie Salas at Writing the World for Kids. 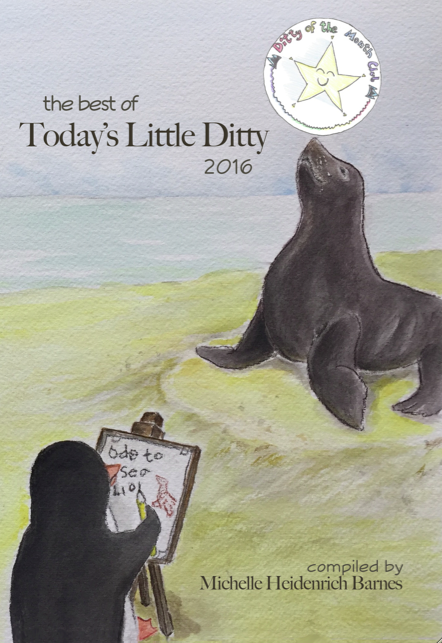 She's done a wonderful write-up of The Best of Today's Little Ditty, including three poems from the anthology. Thank you, Laura! Thanks to Violet Nesdoly for hosting this week's Poetry Friday roundup with a post that is perfect for today.